California is the top clean energy state in the United States for the third consecutive year, and the American West region continues to lead the national clean tech economy, according to a new ranking from industry analysts Clean Edge. 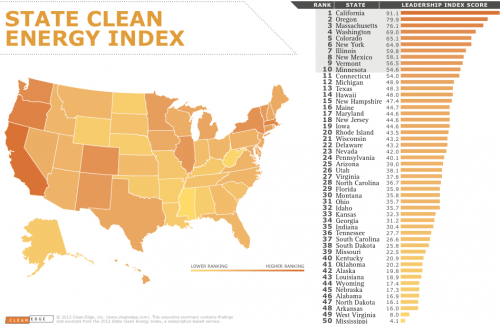 The 2012 State Clean Energy Index, the third-annual such analysis, aggregates various industry data into one scoring system. Overall scores are awarded on a 100-point scale based on three categories – installed technology (clean electricity, clean transportation, energy intelligence & green building), policy outlook (regulations & mandates, incentives), and invested capital (financial, human & intellectual). California dominated the rankings with a 91.1 score, more than 10 points higher than the second-ranked state, even though it lost 4.2 points from 2011. The Golden State “has established itself as the world’s preeminent testing ground for clean technology of all kinds,” and led the country in nearly all aspects of market expansion, including new wind and solar, hybrid and electric vehicles (EV), and green building. However, the state’s most notable achievement comes in attracting venture capital. California-based clean energy startups saw $9 billion in investment over the past three years, more than the combined total of all 49 other states. Oregon held onto its second-place rank, gaining 0.5 points for a 79.9 score. Clean Edge credits the state’s success to consumer-driven demand for clean tech products and services, the highest national participation rates for voluntary green pricing programs, the largest concentration of LEED-certified buildings, and one of the highest rates of hybrid-electric vehicles per-capita. Massachusetts jumped 4.3 points to retain its third-place rank with a score of 76.1. Clean Edge attributes the state’s strength to an existing base of energy efficiency measures, a $500-million infusion of venture capital investment in 2011, and the Boston metro region’s network of universities. The index considers this concentration of education and startups second only to Silicon Valley. Washington State, buoyed by a 9-point increase, jumped from sixth overall in 2010 to the fourth-ranked state in 2011 with a score of 69.0. This ranking was due to newly added wind capacity and strong hydropower output, which helped to generate more than 84 percent of all in-state electricity from low-carbon sources (up from 72 percent in 2010). In addition, the state’s focus on building out an EV charging network could make it an industry epicenter moving forward. Rounding out the top five was Colorado, which maintained the fifth-overall rank from 2010 with a five-point score increase to 65.1. Clean tech infrastructure continues to grow in the state, especially in green building, wind power, and solar photovoltaics. Interestingly, Colorado also checks in as the third most attractive destination for venture capital investment, thanks largely to the U.S. Department of Energy’s National Renewable Energy Laboratory. Six states now generate more than 10 percent of their utility-scale electricity from wind, solar, and geothermal – twice as many as 2010. Nearly two million hybrid cars are now registered in the U.S., and nearly 50,000 all-electric vehicles now ride our roads. The 29 states with renewable portfolio standards (along with Washington, D.C.) now represent nearly two-thirds of the total national generating capacity. Clean energy patents granted to U.S. entities exceeded the 1,000 mark for the first time in history. New York State (64.9) ranked sixth, generating more GDP dollars per kilowatt-hours consumed as a result of extensive energy efficiency measures, and the upstate region is a growing hotbed of clean energy R&D. Illinois (59.8) ranked seventh, reflecting rural areas of the state’s focus on agriculture and biofuels development as well as Chicago’s leadership in green building and energy efficiency. New Mexico (58.1) ranked eighth, due largely to the state’s growing importance to the solar industry and importance as a key market for PV deployment and technology development. Vermont (56.5) ranked ninth on the strength of an environmentally minded population, high percentage of hybrid-EV deployment, and energy efficiency measures. Minnesota (54.6) ranked tenth as a notable national leader in wind energy and biofuels. The state was one of only five in 2011 to generate 10 percent of its power needs from wind, and is among the highest national ethanol producers.